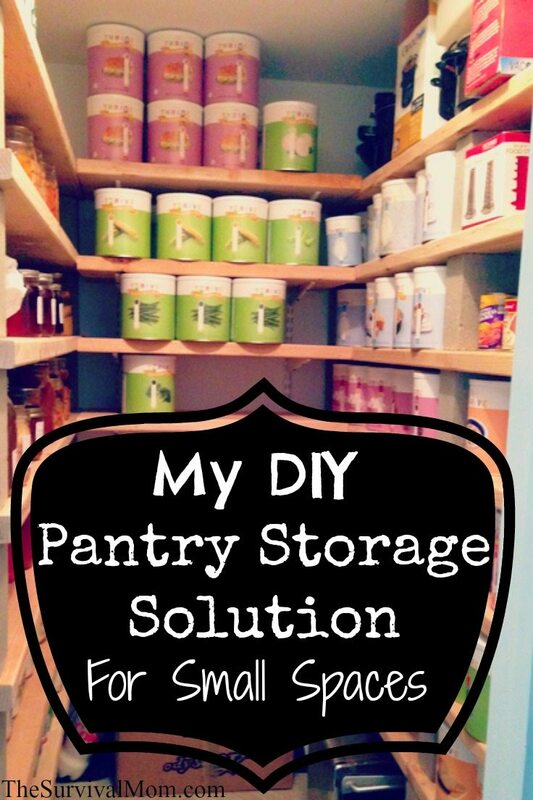 For a while now I have needed more space to store my extra preps, especially my homemade canned goods and Thrive Life freeze dried foods. 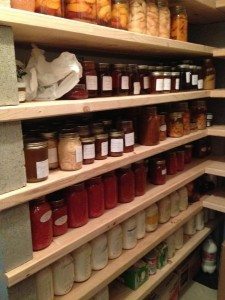 As cans and jars began piling up, I had a small basement room dubbed the “future pantry” with stacks of boxes and Mason jars. Whenever I needed something, it took forever to locate the right box, unstack everything, then restack again when I had what I needed. I even labeled the outside of the boxes, and it was still a challenge to find things! Add some Christmas decorations that got shoved in that small space, my husband’s work boots, and a filing cabinet, and what I had on my hands was a junk room. Something had to change. 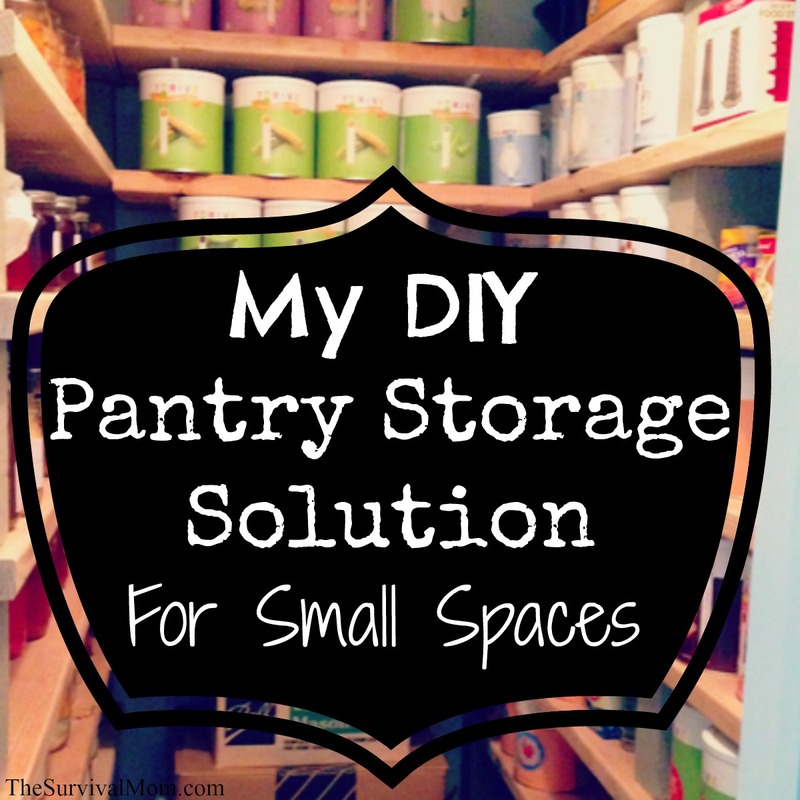 We needed pantry ideas for small spaces! After we got our tax return this year, we decided it was high time to get this project done. 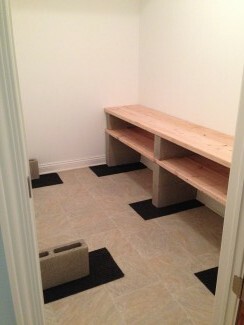 I had looked online at various ideas and decided that I wanted a rustic look this newly organized space. Basically, I wanted planks of wood set on cement blocks, and then repeated for more shelving space. I knew that I needed something heavy duty for the weight of the many Mason Jars I would be putting on it, and large cans of freeze dried food and other staples can be quite heavy. I also wanted the 4″ block instead of an 8″ width. 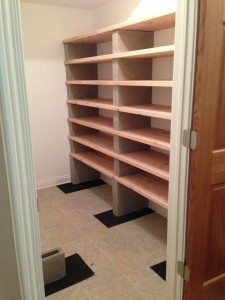 They are the same length (or depth, looking at shelves) but because they are narrower, I could squeeze one more Mason Jar in that space for every 4″ block. One challenge we faced was that for me to walk into the room comfortably, I had to have the shelves on the left side be shorter than the right wall. If they were both the same, when I opened the door, the shelf would jut out into the doorway. Our shelves would be 74″ on the left wall, 90″ on the right wall, and the shortest wall going across the back was 31″. The 31″ wall has adjustable metal shelving to support the boards. We found one stud to anchor the first side. On the other side, we couldn’t find another stud so we had to use Molly bolts. Because these don’t support as much weight, I placed lighter freeze dried #10 cans on that shelf. On the 90″ wall, we added an extra cement block in the middle of the shelf to prevent sagging. We set several step runners down where the first cement block would be placed to prevent damage to our our linoleum. Then a block was set down on each runner. For our walls, we set a 2×10 and a 2×8 down to get the width of the shelving we wanted. From there, it was just repeating the pattern. We started the first boards 15″ up from the bottom of the floor. This left space for boxes of Mason jars, my large stock pots and other cooking pots on the floor under the first shelf. The next set of boards needed to be high enough for an 8″ Mason Jar to slide under, so we laid the next set of boards 8 1/2″ above that. That gave me a little wiggle room to fit my hand in and grab a jar. Once we started, it went very quickly. Something we found out that we didn’t account for was that we had to anchor the 74″ wall into the drywall because when we leaned on it, it would collapse! The 4″ blocks weren’t sturdy enough to keep the shelves from moving. If we had wider blocks, that wouldn’t have been a problem, but we wanted the space to accommodate extra Mason Jars. On the 90″ wall, it was snug, and didn’t need the anchoring. We left a space of 24″ from the ceiling, so I have space for my large pressure canners, food grinders, sausage making equipment, blenders, etc. I can’t believe how much I put on these shelves. I was worried that that there still wouldn’t be enough room for everything, but it exceeded my expectations. The cost was around $400.00 and was worth every penny. The room that looked like it belonged to hoarders is now a thing of beauty and efficiency — proof that you don’t need a huge amount of space to store a huge amount of food and supplies! New to the idea of food storage? Stocking up on extra food, say a few months’ worth, used to be a normal lifestyle for most people. Back in the day, you just never knew how the crops would turn out and when you’d be able to get to the general store. If you have no idea how much food to have on hand, my friends at Food Storage Made Easy have an Excel spreadsheet calculator or you can purchase a simple food storage workbook to keep track of everything you buy: Preparedness Planner from Self-Reliant School . It gives some great advice for stocking up, in general. Looks nice, but I can tell you do not live in earthquake country! The little green jealousy monster wishes I had the space to shelve, though!!! Enjoy! 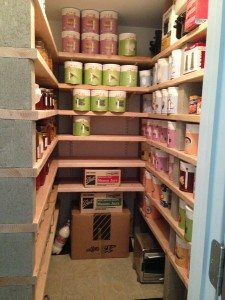 Jan, could you build something similar and attach a strip of wood along the front of each shelf? I’ve seen that done before. Perhaps if I had a closet… I’ll just have to stick with under the bed, I guess! I liked the simple style & the old fashioned look of the pantry. I had someone offer me stainless wire shelving, but it just didn’t look right, plus it was too wide & left no room to get in & out of the pantry. This was quick & easy! I have made shelves like that, only I used the large buckets to hold the shelves in place. It has worked very well. However, if you stack the buckets clear to the ceiling, th bottom ones will collapse. Looks nice and sturdy. If I had a 3rd closet I’d set up like that.